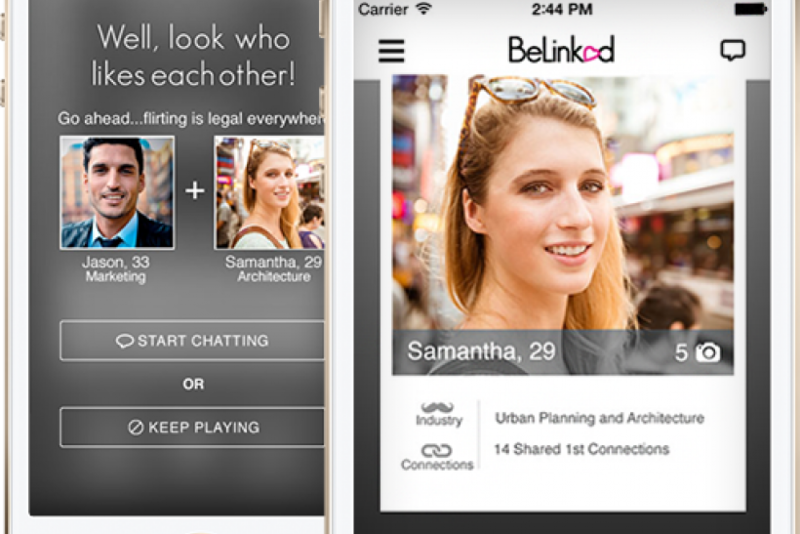 LinkedIn Dating App BeLinked: Tinder For Professionals? Billing itself as “The Tinder for LinkedIn,” BeLinked, a mobile dating app not affiliated with LinkedIn but that culls data and photos from the social networking platform, launched Thursday on iTunes. Originally called LinkedUp! when it was launched in 2013, the app plugs into users' LinkedIn accounts to locate potential matches. LinkedUp! was recently rebranded as BeLinked “to clarify any previous confusion between the LinkedIn and LinkedUp! brands,” BeLinked founder and CEO Max Fischer told Biz Journals. "The new app and features show a clear separation of the brands." Taking a cue from Tinder, the popular mobile dating app launched in 2012 that connects users via their Facebook profile, BeLinked users sign up via LinkedIn. After logging in, BeLinked pulls a profile photo, name and age from LinkedIn, letting users add additional photos and a tagline. Users can choose what information they find relevant to share, and can select dating preferences which are then filtered by gender, age, distance, industry and school, and based on this information, BeLinked provides matches. Like Tinder, BeLinked lets users swipe right to “like” the potential match or left to pass –anonymously. When there’s a mutual match, BeLinked invites potential matches to chat via a built-in messaging function. The app also comes with “BeIntroduced,” letting users recommend potential dates to friends via email or texting. Promotional materials for BeLinked repeatedly emphasize that BeLinked provides, via its LinkedIn user base, “higher-quality” matches compared with other dating apps. Fischer told Biz Journals that he came up with the idea for BeLinked when he noticed that he and his friends were already checking out potential dates by surfing LinkedIn. Linking up a dating app with data meant for professional networking might seem like a bad idea, violating the truism that you shouldn’t mix business with pleasure. BeLinked creators were aware of potential conflicts - the app allows users filter out those in their network. At the very least, BeLinked will provide LinkedIn users who are sending unwanted invites for less-than-professional reasons a more appropriate outlet. Forbes ran an article about this phenomenon in 2013: “Is LinkedIn The New Dating Hot Spot, Or A Breeding Ground For Harassment?” The article answered the rhetorical question with numerous accounts from women who were harassed and even stalked by strangers who were soliciting them for dates and even sending obscene photos. BeLinked is a free iOS app on iTunes, optimized for iPhone 5, and compatible with iPhone, iPad, and iPod touch. An Android version in the works. Biz Journal reports that the Los Angeles-based company is in the midst of fundraising, and Fischer told IBTimes that the he did not have plans for monetizing the company.